Welcome to Throw Back Thursday! Today I want to share my latest completed project. I repainted my older son’s bedroom last week and I finally got it put back together. Wanna see? My husband and I are facing the tough decision of when we want to put our house on the market. Ideally it would be in the spring since that’s when our house looks the best, in our opinion. The grass is green and lush, the pool is open and the flowers are starting to bloom. It is certainly the best time to show our house. So, until that time, I have been sprucing up the house room by room. A few weeks ago I tackled my younger son’s room He had taken all of the furniture with him when he moved out so it left us with an empty room. Since I didn’t want to buy anything new, as we are trying to purge at the same time, I used what we had. After I painted his room I moved the vintage twin beds up from the basement. I’m staging it to be a shared kids room. I lightened up the room by painting the walls in a satin paint by Sherwin-Williams called Accessible Beige. It is a nice, light neutral with gray undertones. It almost looks white in this picture, but I’m pleased with how much larger and brighter the room looks now. I also used the old bedding since it was still in good shape. I did break down and order a few fluffy throws from Pottery Barn to put at the foot of the beds. (I couldn’t resist). They are currently en route. So, my older son’s room, which is connected to this room via a Jack and Jill Bathroom was next on my radar. This is how it has looked for the past few years. Now it’s time to pass along the rest of his guitar collection to him. Also, the desk to the right of the bed feels too tight in this space so I will relocate it to another wall or room. I still need to add art work to the walls, but for now it feels good to have freshly painted walls and a clean new look. After 15 years in the same house, things begin to feel tired and old. So, a little furniture and accessory shuffle can really give the spaces a whole new vibe. Plus, when potential buyers come in they can picture boys or girls in these rooms. This is definitely a house made for children! I found this queen size headboard on our online garage sale for $30. I like the size and shape of it better than the one currently in the guest room. The headboard is heavy and made of really wood but is an orangey color so I’ll paint it white. However, I’m not sure if the existing bed frame will hook to this headboard or not. Naturally I didn’t think about that before I bought it. Worse case scenario, I’ll sandwich it between the wall and bed frame. This is the current headboard in the guest room. Once I paint the other headboard it will go in here. 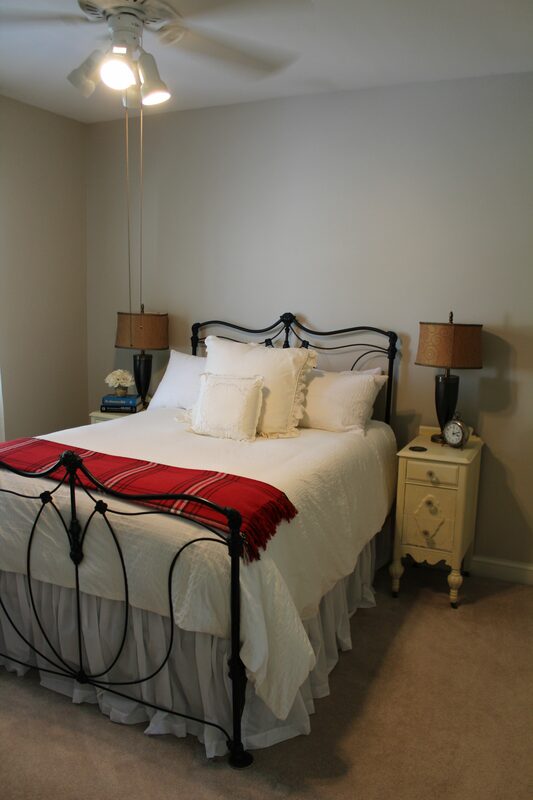 See how I stole the side tables and lamps out of this room for my son’s room? I may steal the picture too.! And now I need to paint this room. And get new nightstands, lamps, etc. I’m sure you understand. If you give a mouse a cookie…. On a thrifty note, I will keep the bedding in the guest room. And the white curtains. I’d love nothing more than to replace the ceiling fans with chandeliers, but being a chandelier hoarder, I couldn’t bear to leave them when we move. So, this way I can keep my sparkly chandeliers for our next house and the new people will have to find their own cool light fixtures. At least they will enjoy the fruits of my labor with freshly painted walls! I hope you have a lovely Fall day! Thank you for stopping by. xoxo Dell p.s. 23 days to go until the wedding!! !